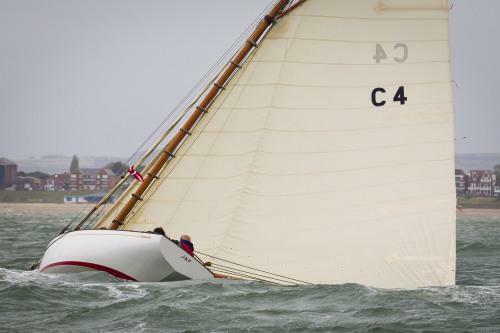 JAP is a Cork Harbour One Design by William Fife III superbly restored by Fairlie Restorations in 2002 for an experienced Irish yachtsman. The result is a much admired yacht, which with her simple, pure lines, generous freeboard and powerful rig, carrying no less than 600 square feet of sail, has successfully taken on the might of vintage gaff class yachts in the Mediterranean and won ! Storage in her own 40 ft container has helped to keep this vessel in 1st class condition and enables easy shipping between venues. The designer Doug Peterson was known to comment on how wise a man William Fife must have been to create a yacht in 1897 anticipating the convenience of fitting her into such a container for use in the 21st century.